Chocolate Oreo Cookie Molds can be so much fun! With some very inexpensive molds, you can make really beautiful chocolate covered Oreos that are designed specifically for the various holidays. For Halloween you might choose a ghost, a cat, a pumpkin, or perhaps even a skull or spider web. For Christmas, a snowman, a snowflake, or a wreath would be really cute. Of course, for Valentine's Day you'd probably want a lovely heart or even two as part of your design. 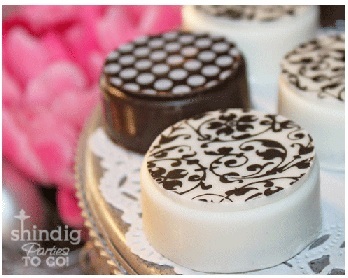 What's really clever is to use a plain Oreo cookie mold and make your own custom chocolate covered Oreos by drizzling contrasting chocolate over the tops, creating shapes with fondant, or go "designer" with chocolate transfer sheets. Beautiful! Making chocolate covered Oreos with a mold is really pretty simple, but you may run into a little trouble. My Oreos keep floating to the top in the chocolate mold - - How can I get them to stay flat in the mold? I'm trying to make chocolate covered Oreos in a snowflake Oreo mold. 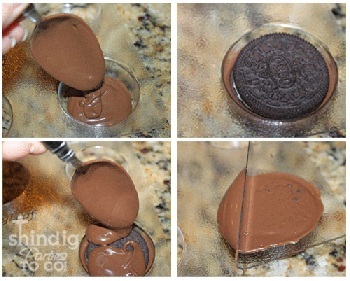 I pour the melted chocolate into the mold and press the Oreo cookie in. Then I fill the mold to the top. But then the cookie starts floating up, causing a moat around the edges. So I try pushing the Oreo back down and adding more melted chocolate, but the Oreo continues to float up. the mold, but I don't know what to do to make the bottom look nice and flat (just in case someone looks!). Well, Marion, I'm guessing that the problem you are facing may be two-fold. The second issue may be that your chocolate is too thin. You may be overheating your chocolate, but even if not, try letting the chocolate thicken (cool) just a bit before beginning the assembly process. It sounds like you're doing everything else right. You put a little chocolate in the bottom of the mold, press an Oreo cookie into the chocolate and then drop more chocolate over the top and down the sides. You'll need to carefully scrape the excess chocolate off of the mold before chilling the cookies. This will give you that nice flat bottom you are looking to achieve. If you are still having no success and continue to feel that your Oreos are floating in your molds, how about pausing the process after you put a little chocolate in the bottom and pressing the cookie in to allow the chocolate to set a bit? This should solve your chocolate Oreo cookie molds problem if all else fails! Now, I want to see YOUR finished molded Oreo cookies. Don't feel badly if they don't look as good as Amanda's above. :) Mine probably wouldn't either! Show them off anyway!